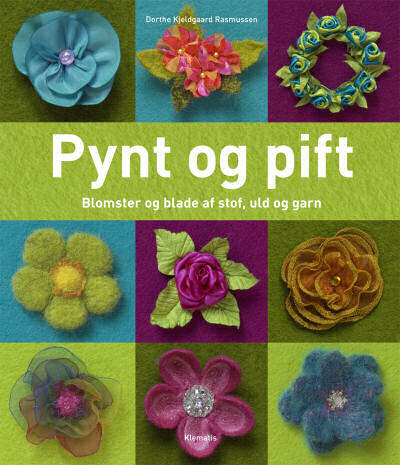 Here you can see the front of my book, to read more about the book go to: Forlaget Klematis, (Clematis Publisher). Textile decoration is many things. There are found examples as: table decoration, greeting cards, small boxes and containers, small soaps with individual design etc. But it cannot be avoided that your own ideas take over and you find so many things that "little something". Of course I am wild with textile decoration, the same craving comes to people that attend my courses. To think that for pence you can produce something that looks like a million dollars! During the production of this book, I have learnt what positive stress is and how many good hours there are in a day, if you don't sleep too much. My ability to set limits to my work, I have not learnt yet and probably never will. My head is always collecting new ideas and thoughts. This I take as a positive thing as would any person with a queue forming outside their bakery shop but first the bread shall rise and be ready for the oven. About the baker, I was born and grew up with my fathers and grandfathers bakery in the adjoining building and here I played with the dough. At home I always sewed and my mother had a women's tailors. Today I cannot exclude any materials that has possibilities for creative development. To collect and squirrel materials, fibre and other good things is something I will never stop. I am like a stamp collector but my parameters are not rigid. I cannot pass by material or wool with good quality and colour, without obtaining at least 25cm. With this book you have the tools and techniques and with a little inspiration you can explore this wonderful opportunity. Take out what is something for you and play with the materials. The mistakes you make you learn the most from. Small mistakes are often the inspiration for something new. Save all the trial pieces, they can be used again in other projects. Costs of materials is small and there is almost no waste, there are just endless possibilities and no limits with this hobby. If you have any questions and cannot find the answers in the book you are welcome to contact me by my home page www.dolka.dk. Here there will also come at regular period's new ideas and techniques. When you have made something from the book or have found your own inspiration, I would be glad to hear from you and if possible with a picture.